Ever since I was a little girl, living in Kenya, I dreamed of going to Rwanda to meet the mountain gorillas. I had read so much about gorilla trekking tours and at the end of last year my dream finally came true! In the weeks leading up to my trip to Rwanda I read up some more, shopped for the necessities - hiking boots, gloves and gaiters, as well as the usual unnecessary items you buy when you’re too excited for an upcoming holiday. The night before I departed I even spent a teary evening watching Hotel Rwanda as the plan was to go and see the infamous hotel in Kigali. Fast forward two days and me and my family were landing at Kigali Airport. We met our friendly guide in the arrivals hall who informed us that today was the last Saturday of the month which meant that it was “clean-up day” or“Umuganda.” As part of the reconstruction of the country in the last two decades, the government has implemented one day a month where the citizens all need to help clean the country to foster a sense of pride in the country. As we drove through Kigali I was in awe! The city of Kigali is unbelievably tidy and manicured - similar to a city you would find here in Australia. We spent a night in Kigali so that we could get a feel for the place, visit a couple of restaurants, see some of the sights and meet the lovely locals. We were fascinated to learn that Kigali is one of the safest cities in the world and also the third greenest city in the world – as declared by the United Nations! In the morning we set off on our 2-hour drive through gorgeous rolling hills saturated with patchwork farming plots until we reached the outskirts of Parc National des Volcans, and the town of Ruhengeri. We had chosen to stay at The Bishops House in the town centre, just 20 minutes from the park headquarters and I am so glad we picked it. The Bishops House is a luxuriously decorated boutique hotel. The staff here are warm and welcoming and it has a real ‘home away from home’ feel to the place, which is just perfect for families. The next day was Christmas day and we walked into the town of Ruhengeri to visit the markets, buy some ‘kitenges’ and meet the delightful locals. We even bumped into this guy on our travels! 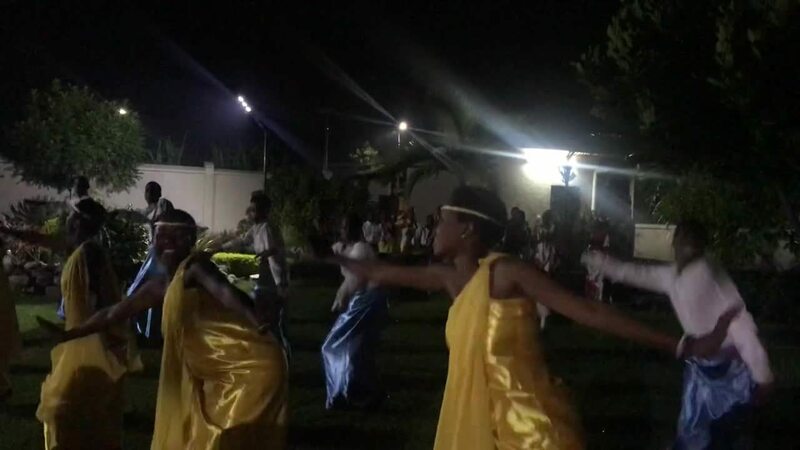 That evening we were spoiled with a sumptuous communal Christmas dinner, listening to the stories of those who went gorilla trekking that day; ending on a high with a traditional dance performed by members of the Inshuti Arts and Culture Centre. With all the excitement of the day, and the anticipation of what was to come, it was nearly impossible to sleep! At 5:30am the next morning we were woken up for breakfast before setting off for the park headquarters so that we could finally experience one of the Rwanda gorilla tours. When we arrived the guides and trackers split everyone up into groups for the different gorilla family groups they would visit. The eight people in our group were then assembled and briefed on the unique aspects and members of the family we would visit, before being driven by our guide to the point where we would start our trek. Our group of 8 was made up of our family and another family, and ages ranged from 21 to 85 years of age. We were so incredibly lucky to have been paired up with legendary gorilla trekking tour guide – Francois Bigirimana. 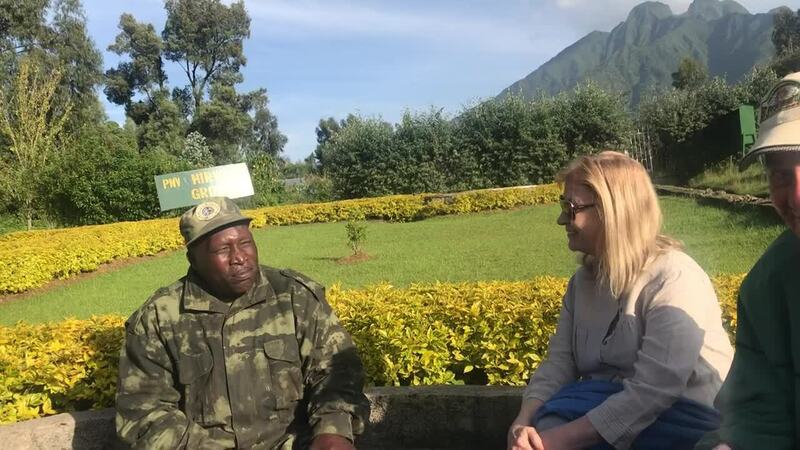 Bigirimana is the park’s oldest and most experienced ranger, having worked there since 1978. President Paul Kagame awarded him a merit certificate and special recognition for his tireless dedication and passion for park conservation efforts and it is abundantly clear that Francois eats, breathes and reveres the gorillas. Everything he does is with wild enthusiasm, whether with his perfected gorilla grunts, chest-thumping leaps in the air or stripping bark off a sapling with his teeth to teach us gorilla habitat and safety. We also had Bosco Avril, a calm and confident expert in gorilla trekking tours, at the helm too. Even though we only had a little bag each, we chose to hire porters because many of the porters were former poachers and this employment is part of what convinced them to value the gorillas in life instead of the money they could make from their death. Is there a more exciting sentence? And also – so much for the epic hike we had prepared ourselves for! After stashing our belongings in a clearing, we continued on our trek for a couple of minutes and then, before we knew it, there was a gorilla making a beeline for us. I’ll be honest, I froze! For a split-second my nerves overtook me but moments later, looking into his kind eyes, a complete sense of calm washed over me. As everyone says, the hour spent on your Rwanda gorilla tour goes by in the blink of an eye. There were 17 gorillas in the Hirwa family we visited, including the youngest gorilla in the entire park who was only about 2 weeks old. ‘Hirwa’ means ‘lucky’ because there is a set of very rare twins in the family. And we were... lucky, that is! They had all stopped in a clearing, meaning that we were ideally positioned to get some amazing photos and videos. As we approached the new mother was understandably very protective and kept her baby out of sight but by the time we left she had her baby out in the open, lying on her stomach as she napped so we were extremely lucky to get a look at the tiny little baby gorilla. Amazing! We delighted in watching the young twins who were racing around, spinning upside down on vines, and just overall acting like young kids who have had too much sugar. The silverback, although a little moody, was very placid. There were two teenage males who kept play fighting, incessantly. And while visitors are expected to keep their distance, gorillas don’t give a damn about rules. We watched in delight as a juvenile tumbled towards one of the guys in our group to tap him on the leg before dashing off into the bamboo. Just like a naughty toddler! 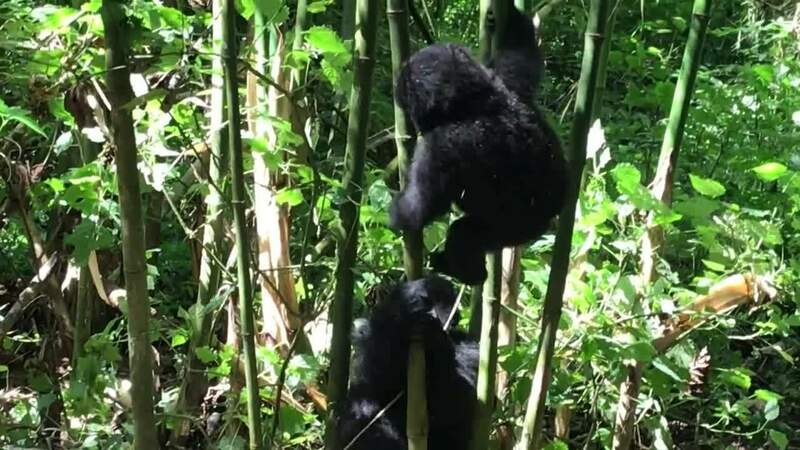 If you're interested, I've put together a gorilla trekking guide based on my gorilla trekking experience in Rwanda - below. What Else is There to do Apart from Rwanda Gorilla Tours? We had visited the Genocide Memorial in Kigali, on our way through, and you can easily spend 3 to 4 hours there, reading all of the stories, paying respects at the gravesite where over 250,000 people are buried, learning about the causes, and reflecting in the beautiful gardens. The memorial is a must-see for anyone visiting Rwanda. It does a fantastic job of educating and remembering the terrible events 20 years ago, with respect and real humanity. Travel has a habit of moving us in ways that very little else can, challenging our perception of the world the more we are exposed to new cultures and surroundings. Rwanda has been my most poignant travel experience to date. In the end, the gorilla trekking experience and Rwanda as a country far exceeded my expectations. To see how much forgiveness and reconciliation has taken place in the short time since the genocide is so inspiring. In a world that is sometimes jaded, it is a compelling reminder of the power of the human spirit. The genocide and its effects are entrenched in every person you meet and every institution visit and yet these are some of the most gracious people I've met. There is no doubt that a visit to this country will change you and the way you think, as it did me. Today Rwanda is one of the cleanest and safest countries in the world and if an entire nation can make such positive strides in such a short space of time then what are we all really capable of? I feel incredibly privileged to have experienced the wildlife and people of Rwanda and hope to return when that 2-week old baby gorilla is leading a family of his very own! Goodbye Rwanda. I’ll be back – how could I not be?